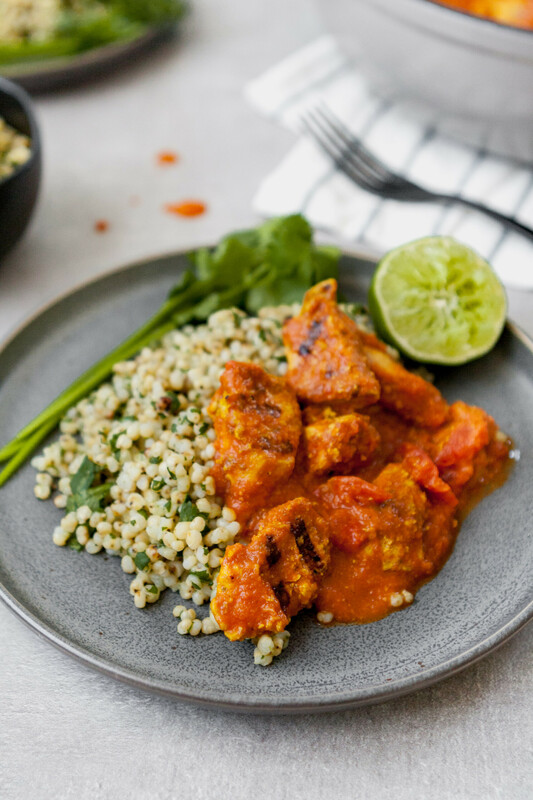 This lightened Chicken Tikka Masala is full-flavored, healthy, and even a great make ahead meal. 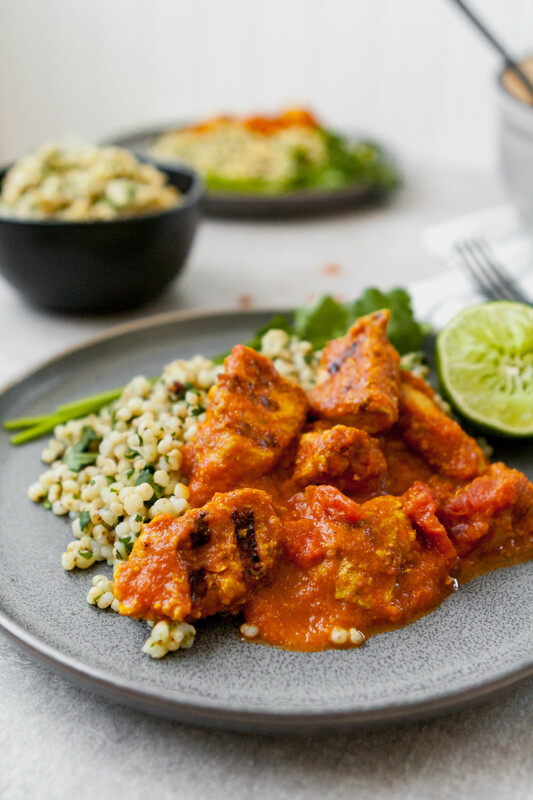 Served atop a bed of cilantro-lime sorghum, this is a classic, reinvented. G and I have a friend who is obsessed, and I mean obsessed, with Chicken Tikka Masala. It’s a kind of obsession you’ve never seen before. 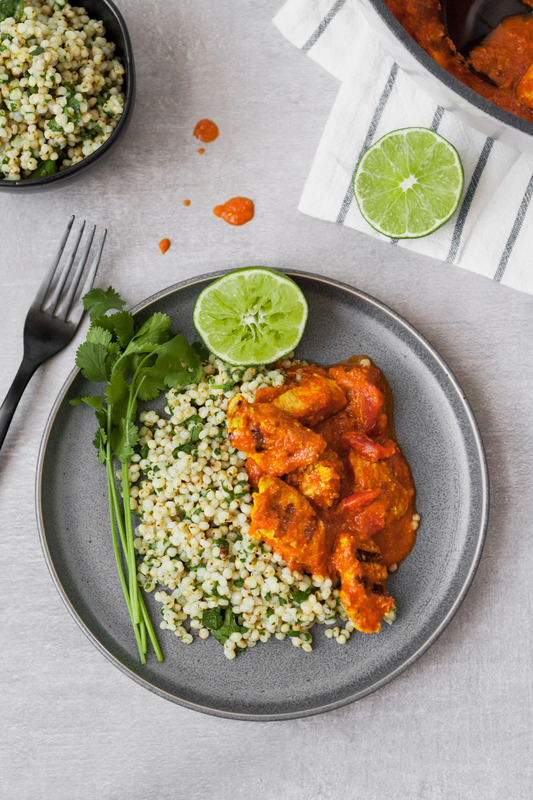 So when I had my sites set on a curry dish for this week’s post, they were quickly shattered thanks to his nonstop commentary on Chicken Tikka Masala (imagine there being a song about Chicken Tikka Masala. It’s quite literally chorused throughout the room when you’re around him). Anyway, as I reimagined this recipe I quickly realized how simple, yet incredibly flavorful it was going to be. And there was only one person who could really give me the blessing of sharing it with you. Instead of using basmati rice or naan (although naan would be a fabulous addition), I chose to highlight sorghum. 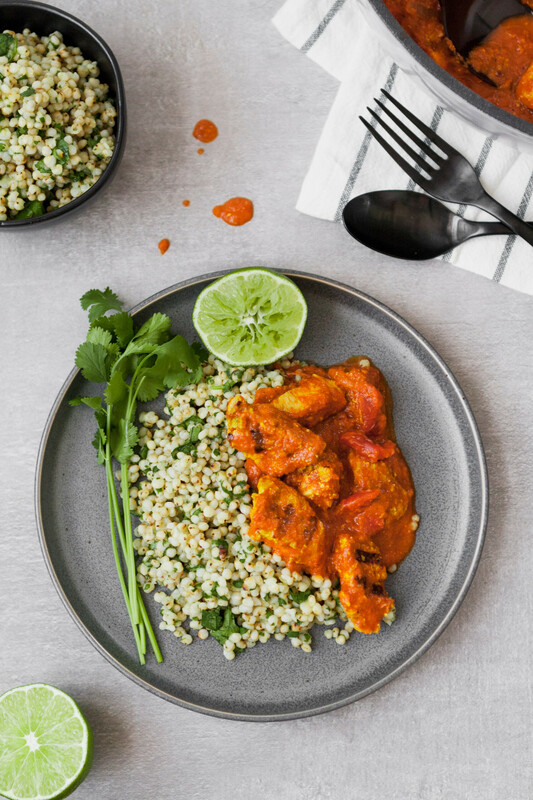 In my continued partnership with NuLife Market, it never gets old exploring the versatility of sorghum, and this dish is no exception. A gluten-free grain, sorghum has a chewy, mild flavor, and takes on most any flavors you throw at it. For this recipes, the sorghum simmers away as the sauce and chicken cook. 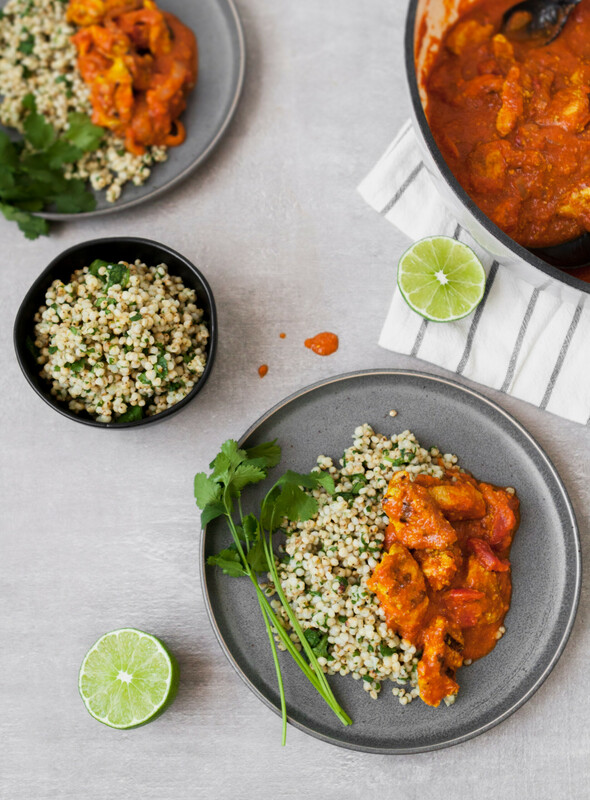 And marinating the chicken ahead of time means this healthy Chicken Tikka Masala comes together in an hour. It’s perfect for both busy weeknights and slow Sunday dinners. 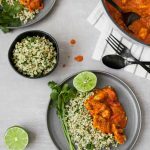 This lightened Chicken Tikka Masala is full-flavored, healthy, and even a great make ahead meal. Served atop a bed of cilantro-lime sorghum, this is a classic, reinvented. And, don’t be intimidated by the ingredient list, many ingredients are used multiple times throughout the recipes, making it look longer! Whisk together yogurt, garlic, salt, turmeric, garam masala, coriander, and cumin in a large bowl. Stir in chicken to coat; cover with plastic wrap and chill at least 30 minutes or overnight (the longer the more flavorful and tender the chicken gets). Toast sorghum in a saucepan over medium heat for 5 minutes. Add water and bring to a boil, then reduce to a simmer, cover, and cook until tender, 50–55 minutes. Remove pan from heat, and let steam 5 minutes, covered, then drain. Stir in cilantro, zest, juice, honey, and salt; season with pepper. In a large pot or Dutch oven, heat oil over medium. Add onion and cook until softened, 8–10 minutes. Add tomato paste, ginger, garam masala, garlic, cumin, pepper flakes, cardamom, and salt; cook 1 minute. Add tomatoes and coconut milk and simmer 20 minutes. Transfer half of the sauce to a blender and purée, then add back to pot with remaining sauce and simmer while cooking chicken. Coat a cast iron skillet or cast iron grill pan with oil or nonstick spray. Cook chicken (avoid scraping off much of the marinade), in 3–4 batches in skillet until cooked through, about 8 minutes. Transfer cooked chicken to sauce. 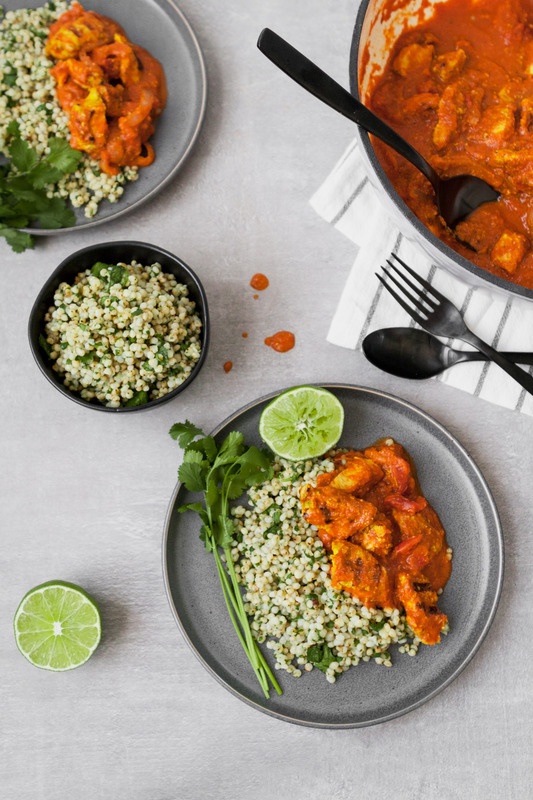 Serve Chicken Tikka Masala over Cilantro-Lime Sorghum. Top with cilantro and serve with lime wedges. If you like your tikka masala sauce really smooth, simply purée all of it instead of just half. Likewise, if you like it chunky, skip puréeing it. Total time reflects hands-on time, it does not include marinating time of the chicken. Each component of this meal can be made ahead and stored in airtight containers in the refrigerator for up to 1 week. Either cook the chicken right before eating, or cook it and store with the sauce.